I offer a full range of dyslexia-related assessment, study skills and education services. My price list is here. Suggestions for dyslexia friendly teaching. Here's an example of an Assessment Report. This is for a young person. Reports for older students or adults are just as thorough, although obviously different assessments may be used, e.g. a report will be tailored towards DSA requirements for a prospective university student. Workplace assessments concentrate on establishing where the employee may be having difficulties, and advising on any reasonable adjustments that can be made by the employer. Conquering nerves and exam preparation for all students. I usually run one-to-one sessions, but for things like exam preparation it is often more interesting for students to be in small groups. 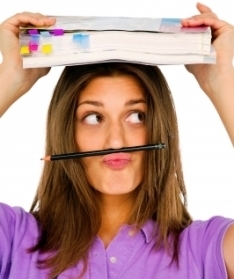 Click on the link for more about the importance of study skills. I am a specialist exam invigilator for Millfield School so I can teach students how to make the most of extra time, or any other form of help they may receive. Training for teachers on dyslexia, and the dyslexia friendly school. Here's some sample slides from a What is Dyslexia? presentation.